The worst advice you can be given about Chocolate in the kitchen is that it is too hard to use. Dont listen for a moment. Everything from brownies to cookies taste better with real chocolate. The beautiful chemistry of chocolate is amazing and although there are some rules to follow, it is really worth the trouble. If you’re like most home bakers, chocolate is one of the things you’ll really want to include in your cooking repertoire. From cake fillings to frostings and dips, chocolate has always been a popular choice. The bitter-sweet, creamy and aromatic flavour of chocolate makes it a great addition in the kitchen. Here at Dello Mano we use real chocolate in everything from baked chocolate cake, brownie to chocolate truffle. I know when I first started using chocolate in the product development kitchens at Cadbury, as young Food Scientists we were obsessed with the myth that chocolate was only for the really well seasoned. True, the absolute talent of chocolatiers is indeed both a Science and Art and they acquire those skills from the many, many hours of concentration, practice and patience (!!). All the same with some knowledge around chocolate chemistry, the rules and some practice you’ll find you will be working happily with chocolate in no time. When working with chocolates, there are some rules that need to be followed. Here are a few tips when using chocolate in the kitchen. Store in airtight dry conditions to retain freshness and flavour. Too often, problems with chocolate are centred on the melting process. 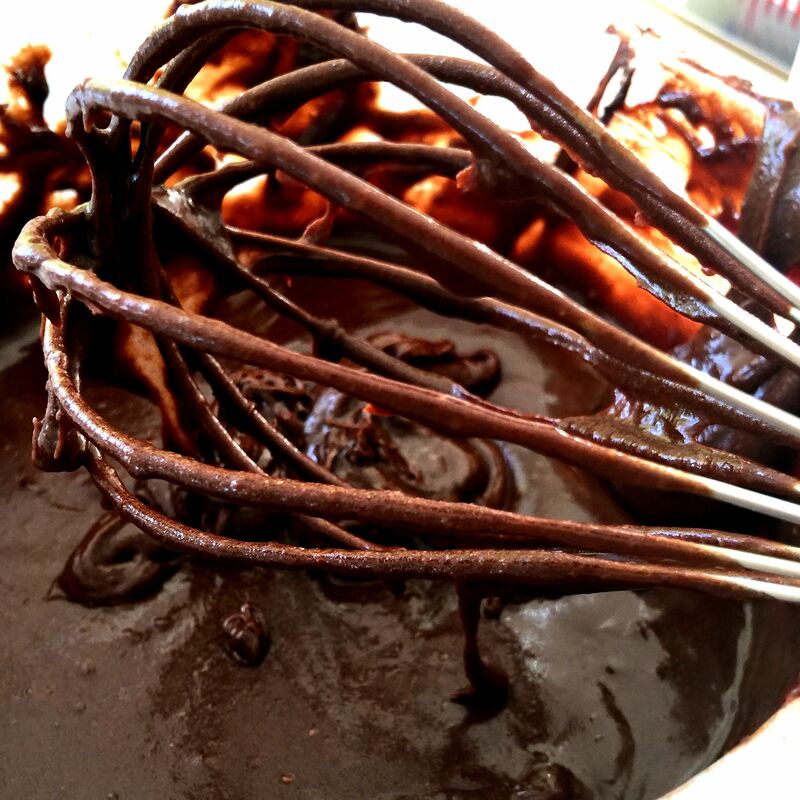 Most recipes for brownies, fudge, chocolate mousse, ganache and cakes require melting the chocolate first before incorporating it to the mixture or batter. And this is where all the trouble often begins. Even a tiny tad droplet of water can ruin a good quality chocolate and make it ‘seize’, or turn into a grainy and clumpy mixture. NOTE: If your chocolate seizes, you do need not need to throw it in the rubbish bin. You can use it for other purposes. For instance, you can wait until it cools down and solidifies again, chop it and use as ‘chocolate chips’ for your cookies or as toppers for your cake. Or, here is a nice idea – you can eat it! While the texture and appearance of a chocolate that has seized are no longer appetizing, the taste is still the same. It is still chocolate after all. When melting chocolate, you want to eliminate any chance that it gets contact with water. So start by making sure that the bowls and utensils you are using are perfectly dry. Try not to use wooden spoons or spatulas to stir the chocolate, as wood tends to retain moisture. If you’re using the ‘double-broiler method’, keep the water underneath the bowl hot, not boiling. Boiling water may splash above the rim of the saucepan, which could cause droplets of water to come in contact with the chocolate. Not only that. Boiling water produces a lot of steam, which can also cause your chocolate to seize. If the recipe calls for melting chocolate with a liquid, like in making ganache wherein chocolate is heated along with heavy cream, you need to watch out for the right proportions. Too little liquid can cause the chocolate to separate. Meanwhile, if you add too much liquid, you could end up with particles of chocolate suspended in the mixture. Apart from making sure that your chocolate doesn’t come in contact with water, you must also ensure that it doesn’t get heated high above the threshold. Chocolate is temperamental. It is very sensitive to high temperatures. If you are melting dark chocolate, be sure to not go beyond 55-58 C If you are working with milk or white chocolate then do not exceed 45-50. Take care as it’s quite easy to exceed these temperatures if you are using a double broiler. Best bet is to not let the water come to the boil, just to be safe. Take extra care when using a microwave, overheating chocolate is still possible if you put it in maximum heat. I find when brownie baking that it is best to stop and stir to make sure that there are no “hot spots” forming in the chocolate. Having a candy thermometer around is helpful. Oh and just like cooking with wine – the better quality the chocolate you use, the better quality will be your cooking result. Working with chocolates can be a real challenge. We bake brownies everyday and we’re still in love with chocolate. The effort is always worth it. And once you get the hang of it and accept that chocolate is the “boss” – you’ll be the best of friends. Previous postWhat sets artisinal brownies apart? Some great tips 🙂 Will be trying very soon!